Did you know that man-made blue light is bad for your brain? But not only our brain health, but eyes too! Artificial blue light spectrum emitted from LED & LCD lightbulbs is a modern day health problem for millions of people. Let me explain. It is incredible how humans discovered how to make light using electricity! However, we have now discovered that that same indoor light can harm our brain function. The good news is there are solutions and remedies available. So we can still go on living under artificial light to enjoy our social times in the evenings, but not harm our brain health anymore. A simple health hack is to wear a pair of blue light blocking glasses. I’m going to share with you my four recommended brands if you are in the market looking for a pair of blue blocking glasses. These were my first pair of blue blocking glasses. I personally bought the lighter lens colour option to start, which is a lighter yellow hue. The reason I went with the yellow lens vs amber lens was so I could wear them around the office during the day. I didn’t want to stand out too much by walking around with dark lenses indoors, and also dealing with the public at work. 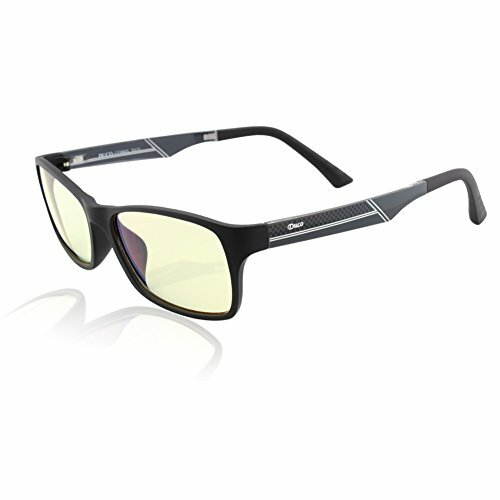 The were designed as blue light protection glasses to help minimise eye strain when looking at a screen. I feel they do that job very well. What like about these is that they are so light you hardly feel them on your face. The bendable arms on make them very comfortable to wear as they adjust to my head width. If you have a wide head and find some frames are too narrow get these as they will bend to your head shape & still feel good. 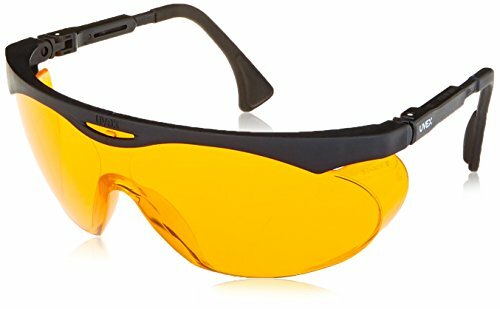 I would suggest getting a pair of these plus the darker red/amber lenses frames so that you can switch between which ones you wear during the daytime and nighttime. The nice thing is Duco make a darker tint too for maximum protection of the blue spectrum. Those are these Duco Pro Amber glasses. The Duco computer glasses are available to buy on Amazon here . The Uvex S1933X Skyper Safety Eyewear is very popular set of frames for many people concerned about excessive blue light through their eyes. The brand were one of the original glasses available on the market to buy. These glasses are designed to help block light coming in from all around our eyes. The other frames are designed to block the light when you look straight ahead like normal sunglasses. The Uvex lenses help to block light streaming into your peripheral vision fields too. If you are looking for maximum protection or are sensitive to any form of light then wrap around lenses are necessary. The SCT orange lens tint are said to help Computer Vision Syndrome. This for people who are damaging their eyes from computer screen glare. The claim to help improve focus, reduces eye fatigue and help inhibit vision problems, like cataracts and age-related macular degeneration. They aren’t the most stylish as they were designed as safety glasses for dental hygienists and lab technicians. So they aren’t made to look cool at a regular smartly dressed admin office job, unless you work in a science lab of course. The Duco Pro Amber glasses provide that darker orange tint which is more ideal to use when it is naturally getting darker outside. 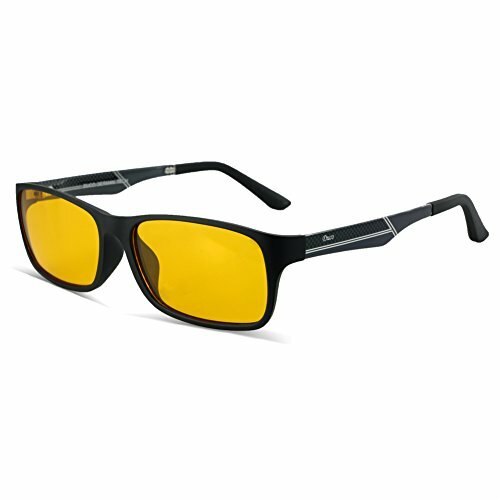 These are great if you are a gamer and out at an event or cafe that is dark, but don’t want to look too strange wearing the Uvex glasses around others. These Duco are a stylish frame that you can easily wear out to social events. Some people feel the lens doesn’t create a crisp sharp view compared to some other frames. The Duco Pro Amber glasses are available to buy on Amazon here . The Swannies are made by Swanwick Sleep. James Swanwick is the man behind the brand. He had the idea to develop these dark amber lenses to help people sleep better at night. Blue light emitted from fluorescent bulbs & from our mobile phones, laptops and TV screens disturbs our circadian rhythm. The circadian rhythm is our internal body clock. This clock helps us wake up and fall asleep at the right times. James recommends putting the swannies on 1-2 hours before you know you want to go to bed. However, these aren’t just designed to be sleep glasses. Swannies were a BIG hit at the Bulletproof Conference on biohacking health. Biohackers are always looking for optional health. I saw hundreds of people wearing their swannies for eye & brain health at the conference. So you can wear them when indoors when you have to be under bright fluorescent light. The Swannies are available to buy on their official website here.